Our products are made with the finest materials available. With more than 40 years of experience in the Pro Audio Industry we have developed some very useful and robust tools for the audio professional. The AudioMan BOX is a very popular isolation transformer that has unparalleled performance in the field. From touring system engineers to major sound companies, The AudioMan BOX is used for line level isolation and intercom interface. Read the item descriptions for more information. The AudioMan Push To Talk is a very handy remote microphone switch. This PTT is quite popular in broadcast booths and stage manager positions. The AudioMan BOX comes with a Lifetime Warranty provided they are not physically damaged or exposed to an excess of 50 volts @ 100 milliamps. 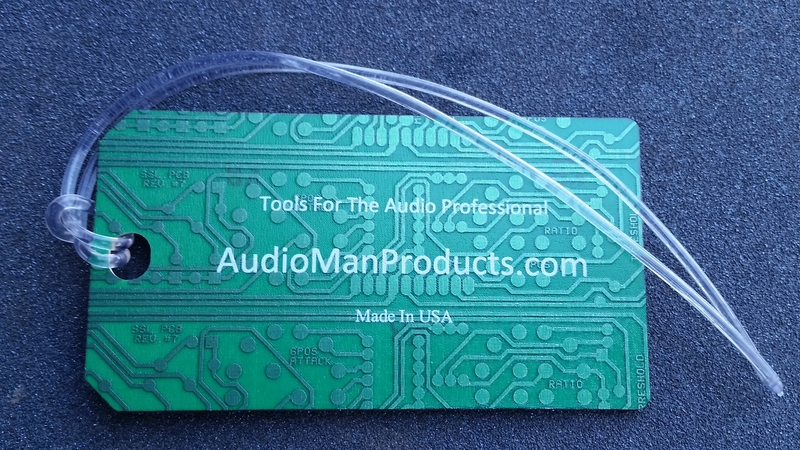 The AudioMan Push To Talk comes with a One Year Warranty from date of purchase provided they are not physically damaged or exposed to an excess of 50 volts @ 100 milliamps. NEW FEATURE: FREE Luggage Tag With Every Order.